…it was all those marvelous Bat-toys. Who can forget the Batarangs, the Batshield and, of course, the Batmobile. And in that mix was a particular orange helicopter that, like many a Hollywood starlet, was soon forgotten after the show ended. Will the Batcopter be lost forever? Will no one ever get to enjoy it again? In need of two more solid, dependable helicopters for his shuttle-and-sightseeing business from the heliport on the Steel Pier of the Trump Taj Mahal Casino in Atlantic City, New Jersey, circa 1990, pilot and entertainment entrepreneur Eugene Nock, a certified airline transport pilot, found them on the other side of the country, California. Pre-internet, he was forced to pick up the phone to make the deal. After the deal was completed and a check sent, Nock received the logbook – a detailed account of every flight flown, including duration, number of lands and more – on each of the vehicles. Sure enough, he had indeed purchased the Batcopter. Nock himself is no stranger to the entertainment business – he’d grown up in it. The son of two of the Nerveless Nocks, the famed sway pole entertainers who moved from Switzerland to the United States to headline the Greatest Show on Earth for then owners John and Henry Ringling North, he’d worked in the business himself. But as the years moved on and his career progressed into production and promotion, his passion for flying never waned. With the original Batcopter, Nock knew he had something special. So Nock, after a serious inspection, started the painstaking job of returning the helicopter to its Batcopter glory. “It needed to be painted, and have other items restored,” said Nock. The signature batwings, destroyed after the end of the show, were not replaced due to aerodynamics. Today, between comic cons, airshows and events, the N3079G and its pilot stay busy. Being a member of the Screen Actors Guild and a registered Screen Actors Guild pilot, the Batcopter still gets occasional work, usually acting as a flying camera boon. Nock, like his famed helicopter, has had a front row seat to witness the evolution of his craft. It’s a market, he thinks, that will continue to thrive. 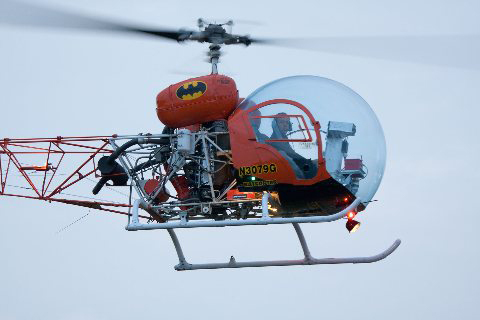 The one and only N3079G Batcopter will be on the grounds of the SUN ‘n FUN fly-in for folks to enjoy the whole week. If you’d like to see it take to the air, the Batcopter will be participating in the various showcase fly-bys during the event.